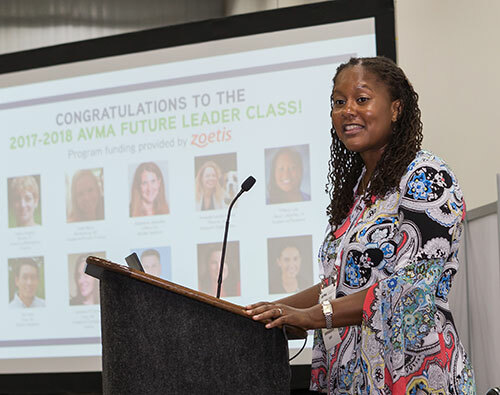 At the American Veterinary Medical Association's (AVMA) annual convention in Indianapolis last month, Dr. Tiffany Lyle, Purdue Veterinary Medicine assistant professor of veterinary anatomic pathology, was introduced as a member of the AVMA's 2017-2018 Future Leaders Class. The Future Leaders Program is for exceptional veterinarians who have graduated within the last 15 years. The one-year curriculum, funded by Zoetis Animal Health and guided by High Impact Facilitation, helps to sharpen members' leadership skills in the veterinary field. At the press conference held to announce the members of the seventh class of Future Leaders, AVMA President Tom Meyer gave the welcome address. "Each class develops leadership skills to advance veterinary medicine, the veterinary workplace, and society as a whole, as well as creating resources for their veterinary colleagues," Dr. Meyer said. Throughout the press conference, the class members' diversity, strength, knowledge, and deep commitment to their patients, clients, and colleagues were highlighted. "I am honored to be selected as a 2017 AVMA Future Leader," Dr. Lyle said. "Over the next year, I look forward to working with the AVMA as I design and execute a road map for career trajectory and my engagement in organized veterinary medicine." During the press conference, Dr. Lyle was presented with a commemorative compass from Dr. Katie Rhorig, a representative of the outgoing 2016-17 class. "This represents the guidance and direction this program provided us on our journey in veterinary medicine," said Dr. Rhorig. "We know it will do the same for you." Dr. Lyle earned her DVM degree from the University of Georgia in 2008 and then came to the Purdue University College of Veterinary Medicine where she completed a residency in anatomic pathology in 2011. She became a Diplomate of the American College of Veterinary Pathologists in 2012. Just last year, Dr. Lyle earned her PhD from Purdue University through the National Institutes of Health (NIH) / National Cancer Institute (NCI) Comparative Biomedical Scientist Training Program. Since the spring of 2016, Dr. Lyle has served as an assistant professor in the Department of Comparative Pathobiology and director of the Histology Research Laboratory within the Center for Comparative Translational Research. Dr. Lyle's research focuses on the molecular characterization of the blood-brain barrier in disease, primarily regarding the formation of the blood-tumor barrier in brain metastases of lung cancer. Congratulations to Dr. Lyle for being one of ten veterinarians selected for the 2017-18 Future Leaders Class! The other class members include veterinarians from Connecticut, Mississippi, New Jersey, Arizona, North Carolina, Maryland, Michigan, and California.